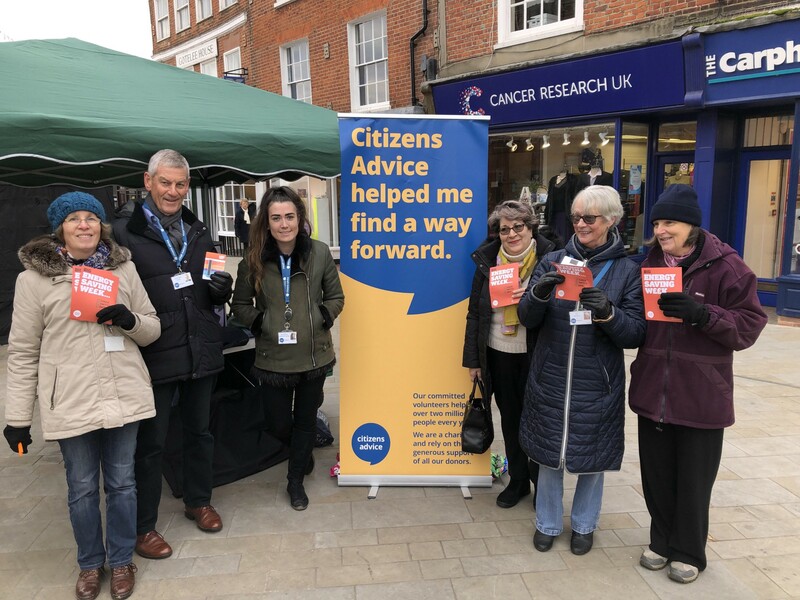 With Big Energy Saving Week 2019 almost over, Citizens Advice Wokingham can reflect on a promising week of public engagement in Wokingham and Woodley. Across the town centres, 225 members of the public were engaged by our Big Energy Saving Week stalls. The aim of Big Energy Saving Week is to advise and inform the public on how to save money on their energy bills. Customers can save hundreds of pounds by switching energy supplier or their tariff. They can talk to their supplier or local Citizens Advice if their bill appears to be incorrect, or save money by improving the efficiency of their home energy via insulation methods or careful handling of household appliances. Leaflets providing such information were distributed, alongside 56-page booklets providing the public with more detailed information and five pages of useful contact details for energy suppliers. A leaflet advertising the general Citizens Advice service was also offered, with 10 members of the public asking about what Citizens Advice do. The stalls were manned by friendly and willing volunteers, led by Research and Campaigns Co-coordinator Ros Croy. On Wednesday 23rd January, Ros was aided by Essie Shayanowako at a stall in Woodley Town Centre Market Place, where they engaged with 63 members of the public with leaflets, booklets and general advice. On Thursday 24th January, Ros Croy was joined by Jeremy Best, Jenny Smith, Ros Walsh, Diane Darling, David Hunter, Jasmine Waters and Prasanna Taduri in Wokingham Market Place at another stall. Here, the volunteers reached 162 members of the public with the same material in a very successful outing. 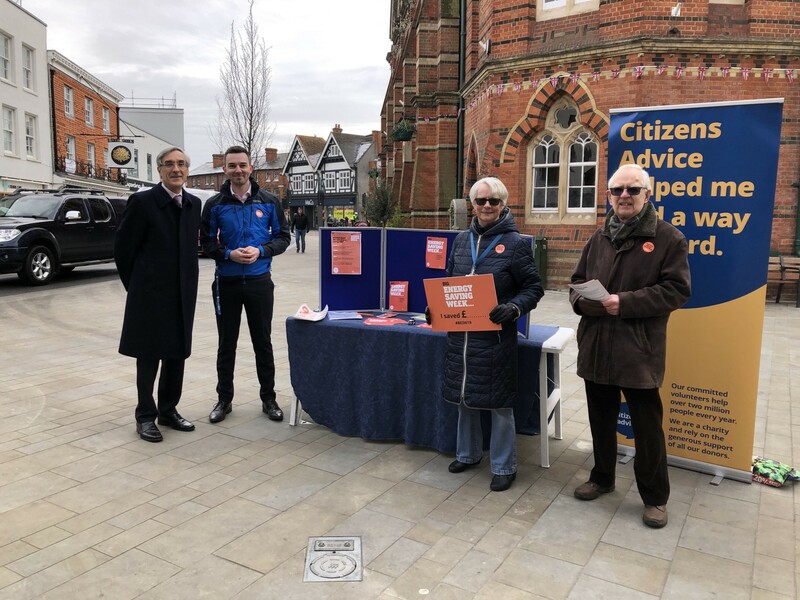 Citizens Advice Wokingham Chief Executive Jake Morrison said: “It has been a great week for promoting our work out and about in communities across Wokingham. Thank you to our dedicated team of volunteers, staff and trustees for supporting this work. This stall was also attended by Sir John Redwood, MP, who represents Wokingham. Sir John took an interest in the aims of Citizens Advice and the Big Energy Saving Week campaign, and came to the Citizens Advice Wokingham office for a tour and introduction to the service from Chief Executive Jake Morrison. The success of the week is entirely the result of the hard work and dedication of all of the volunteers who took part, and hopefully the campaign will help many people in the local area save money and energy.